Menopause Flashes | Turning Up The Heat: How many women reach menopause each day? As a sensual researcher I often search out simple ways to answer questions about menopause that I can easily pass on to others. Recently I was wondering - What is the rate of growth for women in menopause in our population? 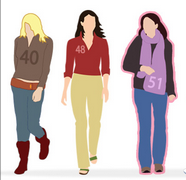 How many women reach menopause in the United States each day? How about in the world? Yup, that's my tech-geek side coming out again chewing on numbers for fun. Basically I wanted to know how many of us are there? I ran across this infographic that put a few things in perspective. I know isn't it crazy, 2 million per year...if this infographic is right. My favorite part is that the menopausal years are the most fulfilling. I am looking forward to that after the hot flashes fade! It is alot of women. Thanks for stopping by. Wow, thank you for compiling this helpful information. I am loving my menopausal years.